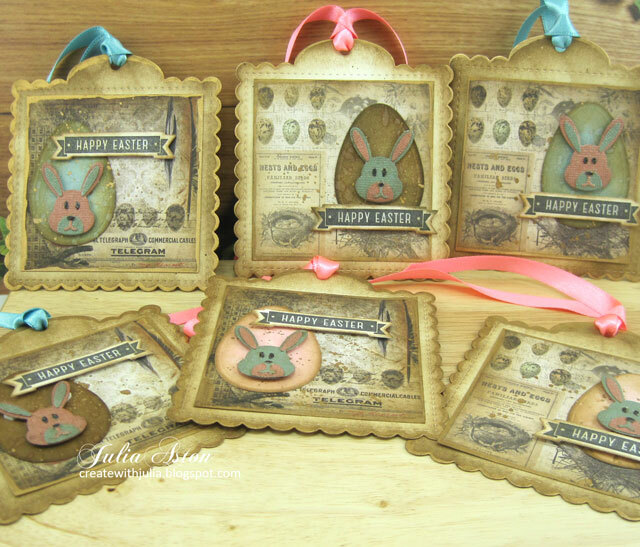 Those are great shaped tags Julia, beautiful teamed up with those Easter themed elements. I adore your speckled eggs, I appreciate the time you have taken to put them together, those little bits are so fiddly but when put together they are worth all the love and attention given to them. Fabulous tags. Happy Friday & Thank you for sharing. Oh my Julia you have combined those beautiful eggs and bunnies to create such fabulous Easter tags, they are amazing. I love how you’ve used those lovely papers of Tims to begin the layering and finished off the backs with it too. I love them and I’m sure you’ll sell them very quickly at the church Easter sale. Love your beautiful selection of tags! 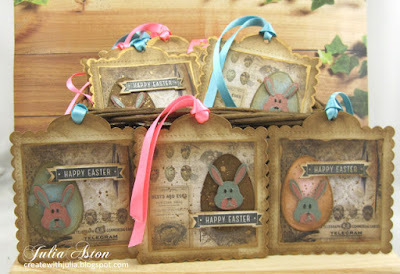 I wouldn't have thought of doing vintage-style Easter tags or cards - great idea and great results! 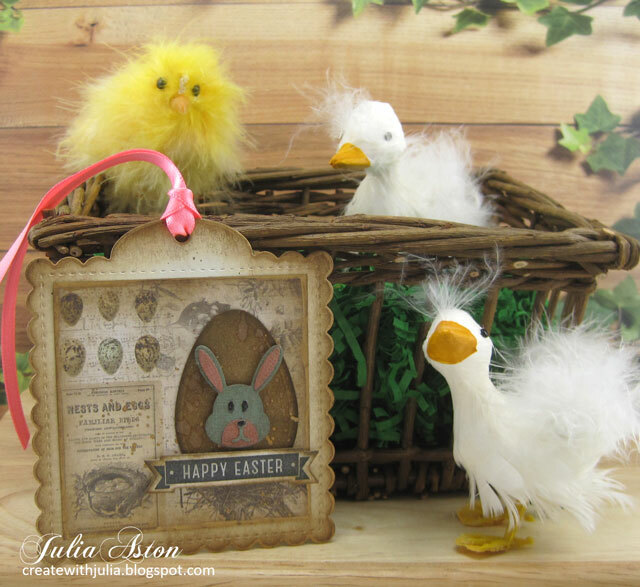 These Easter items are so cute!! I really love how good you are at both explaining and showing how you do everything!!! 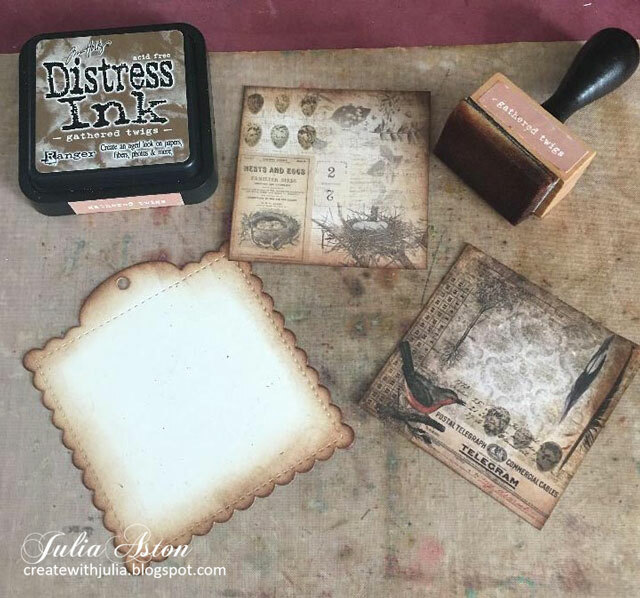 Julia, these tags are just ADORABLE! 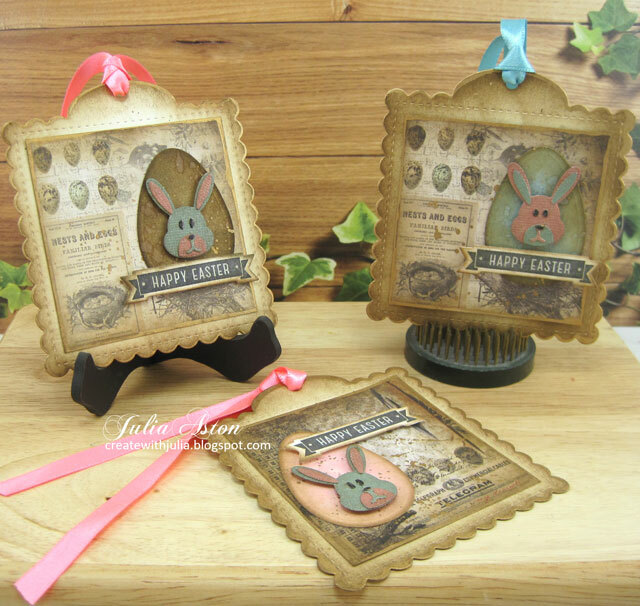 I love how you've paired up the bunnies with the egg and tag die cuts and created something both vintage and sweet! No doubt these will fly off the shelves at your church Easter sale! Happy Sunday! What a cute collection of vintage Easter tags, Julia! The bunnies are so adorable and I love the colors of eggs. I'm sure the tags will sell quickly. Thank you so much for sharing how you made them with pictures. It's always fun to see the process. This is the most adorable collection of vintage Easter tags Julia, and I adore the setting in which you photographed the main one. Love them all! They sure do look pretty and so unique x. Those bunnies are super cute and love how you did the eggs. They are bound to sell quickly and it looks like you had fun making them? x. 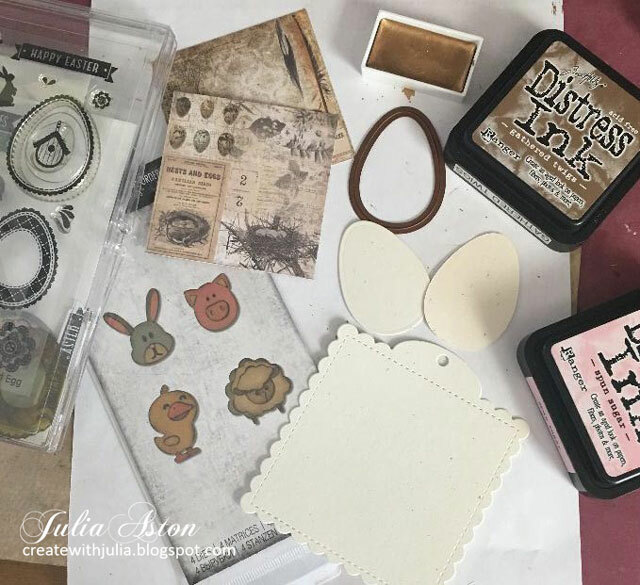 Wonderful Easter tags, Julia! Love that sweet bunny and the speckled eggs. Love those fuzzy critters too. Wow...these are so beautiful! Love the wonderful vintage look you gave your sweet Easter eggs and tags. These are so sweet, Julia - and yes, your eggs are simply gorgeous. I love the photo of them all lined up together - lovely colours! Love the square tag shape too, and those pretty scalloped, stitched edges. Your easter tags are absolutely delightful, Julia and as you say laid out together they look wonderful. They hold such a sweet vintage charm and really warm the heart. You are so good at creating fabulous seasonal pieces and these clearly demonstrate that .